Oh how I love Weight Watchers crock pot recipes. My days have been SO hectic lately, and the crock pot saves my sanity. I get the food in the crock pot in the morning, after I’ve had coffee and am full of energy, then come dinner time, when I’m often worn out and exhausted I have a healthy dinner, ready to go. Often times, when I’m feeling way too tired to cook, I’ll order take out or have my husband pick up dinner on his way home. This can ruin my entire day of eating healthy. So having a delicious and healthy Weight Watchers friendly dinner in my crock pot is often a big part in keeping me on track. And today, I wanted to share a new favorite Italian Chicken Crock Pot Recipe of mine. often called “Angel Chicken”. Each serving is very low in Points and it is delicious! Chicken smothered in a creamy mushroom wine sauce? Yes, please! For some extra Points, serve it over rice or pasta. It also works really nicely over asparagus or roasted bell peppers. This crock pot chicken recipe is a real crowd pleaser. Enjoy! Creamy and flavorful, this is one slow cooker recipe that’s a real crowd pleaser. 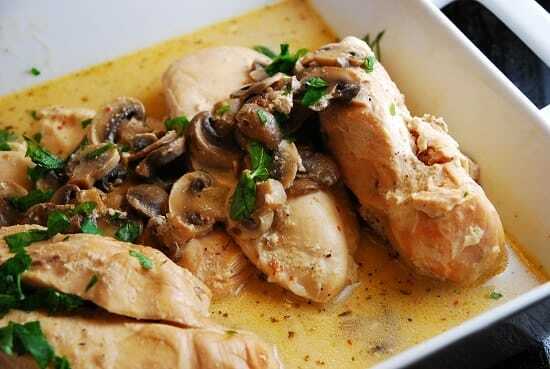 A wine and cream cheese based sauce is seasoned with Italian dressing and smothers mushrooms and chicken breasts. It’s an easy Weight Watchers crock pot recipe that the whole family will love. Add in Italian dressing packet, and stir to combine. Stir in cream cheese, wine and chicken broth, and stir until cream cheese is fully melted, and ingredients are well combined. Place mushrooms on bottom of crock pot, then season both sides of chicken with salt, pepper and paprika and place chicken breasts on top of the mushrooms. Pour cream cheese sauce over chicken breasts, making sure all chicken is evenly covered with the sauce. Have you ever made this in an Instant Pot? If so, please advise on cooking length. Great question! I haven’t tried it yet myself, but I’d suggest cooking on high pressure for 15 minutes, with a 10-15 minute natural release. If you try it, please come back and comment and let us know how it goes! my family doesn’t eat mushrooms, what do you think I could substitute? You could use zucchini, cauliflower or any other veggie you’d like. it seems fantastic, But could I omit wine? I am making this right now and it tastes delicious! Thank you! Could you change this to cook it in the oven? Could I use pork chops instead? they’re very lean… I just accidentally bought groceries for another recipe- but this looks better! I haven’t tried it myself, but I don’t see why not! Love this recipe, however, I do leave out the wine and double the chicken broth. Also, I used a ranch packet one time instead of the Italian but both tasted great. If you aren’t on a diet, this is great over mashed potatoes or noodles.
! 5 hours ! ! ! pasta (it’s just me so I got multiple meals out of it!) there is a lot of sauce. Next time I most likely add more chicken. Made this today but swapped out the cream cheese for 6 oz of nonfat greek yogurt, a salad dressing seasoning mix instead of the packet (the packets I could find all were majority sugar…), and used 1 tbsp white wine vinegar + 1 cup chicken stock instead of the white wine and it was great! There was still a ton of liquid because I needed to cover the chicken breasts and I didn’t know what to do with it, so I thickened it up with about 3 tablespoons of corn starch and made some low calorie gravy. Thanks for the recipe!! The fat in the cream cheese helps it to blend and bind with the other ingredients in the sauce. I would recommend using a cream cheese with more fat content – the more fat, the better it will blend. I normally LOVE every recipe I have used from your site. This one….not so much. I think 1 cup of wine was too much. We couldn’t eat it at all. I’m not giving up though. I’m just going to cut back to 1/4 or 1/3 cup of wine the next time. Thanks for so many amazing recipes. We’re not big white meat fans. How would the points change if I used boneless, skinless thighs? Not by much…I’d guess it would be an additional 1-2 Points per serving. This is a truly low cal dish. Sometimes people not on diets don’t quite understand low calorie or sugar-free. Thanks so much for sharing. This sounds great.